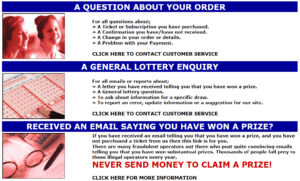 LotteryShop is a curious artifact from a bygone era of the internet – one that I'm hesitant to recommend to lotto lovers. LotteryShop’s game selection is quite decent, despite not being as vast as what their competitors offer. They also make prize claiming easy by taking care of everything on your behalf. Plus, they don’t take commissions from your winnings, so you get exactly what you win. Unfortunately, on top of their painfully outdated website, LotteryShop only accepts a very limited number of payment methods. They also don’t accept single draw purchases, which means you can only participate in multiple draws. As a result, you would have to invest a bit more money here than you would at other sites. In short, there are better sites than LotteryShop. But if you are still interested, then read on! LotteryShop offers a good variety of games. They feature popular games like US Powerball, Euromillions, and Mega Millions, along with less popular ones like USA Mega Jackpots and Japan Jumbo Draw. Surprisingly, LotteryShop also offers a few group play games – though they don’t really do much to advertise that fact. You wouldn’t immediate know they had syndicates (because of their website’s terrible layout), but they’re there if group play games are your thing. Unfortunately, you won’t get much to choose from as they only offer 2 syndicates: Euromillions and Spanish El Gordo. LotteryShop’s banking methods are quite limited, which is disappointing. They currently accept only 5 payment methods – Visa, MasterCard, American Express, JCB and Diners Club. As you can see, LotteryShop doesn’t accept payment from online wallets, so if you don’t have any of the aforementioned credit cards, you won’t be able to play here. As for withdrawal methods, you won’t have to worry much as LotteryShop automatically deposits all winnings to your bank account. LotteryShop doesn’t look like it, but their website is quite safe to use. For starters, the website utilizes SSL encryption to secure any transaction going to and from their site. They say that they utilize GeoTrust, which was confusing since clicking the padlock image on the URL bar states that they use GoDaddy. It’s not a huge deal, to be honest – I just found the inconsistency a bit weird. Beyond that, LotteryShop also passes Norton Websafe’s website scan with flying colors. LotteryShop’s customer support options are, to be blunt, quite terrible. For starters, their Help Desk page, which houses their FAQs, are ridiculously barebones compared to other lottery sites’. The information there doesn’t say much at all – some, in fact, tell you to contact their support agents instead. You won’t learn more about LotteryShop’s service here, that’s for sure. LotteryShop’s Help Desk isn’t exactly helpful. Should you choose to contact them directly, you only have one option: submit an online contact form. Technically, they also offer live chat, but when I tried it, it was practically useless. Clicking on the “Continue” button to connect with a support agent does nothing. I tried it on two different browsers and still nothing. So, yes, you just have to make do with the online contact form. Not exactly ideal if you have a pressing concern. Lottery education isn’t LotteryShop’s strong suit – and it shows. LotteryShop does provide nuggets of information about each lottery game – from prize breakdowns to quick facts – but that’s about it. They don’t make a solid effort at all to teach newcomers how each lottery works, nor do they provide a lottery glossary. If you are new at lottery – or online lottery – there are more beginner-friendly sites out there. LotteryShop’s website is a mixed bag: it’s terribly designed, but easy enough to navigate. LotteryShop seems to have all but given up updating their website – the entire thing looks and feels like it was made in the late 90’s or early 2000’s (which it probably was). It’s also frustrating how some elements of their site are either broken (like the live chat) or so terribly coded that it messes up the layout. And did I mention that their lottery results page is so horribly outdated that the latest results are from a year before? That’s ridiculous. Parts of LotteryShop’s site are broken or horribly coded. For what it’s worth though, navigating LotteryShop’s site is easy enough. Links to the different games and pages are clearly laid out, so you don’t really have to scour their website to get where you want to. It’s also worth mentioning that LotteryShop supports over 100 languages. However, they didn’t actually do the translating – it’s powered by Google translate, so expect a hit or miss affair. Still, kudos to them for even including this feature. 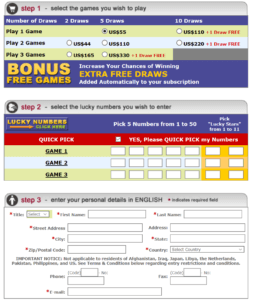 Unlike other lottery sites, players don’t get their own personal accounts here – you simply go straight to playing. It’s not as seamless a process as one would think though. When you land on their homepage, you can see the whole list of games below and at the left navigation menu. Choose your game from whichever of the two lists. After choosing your game, you will be taken to the homepage of the lottery game you have chosen. Find and click on the “Click here to order now” or “Click here to enter next draw now” link. Choose the number of draws and games you wish to purchase tickets for. It’s important to note that there are no options for single draws – only multiple draws here. Pick your numbers manually, or you can tick the Quick Pick box if you want your numbers to be automatically chosen for you. Confirm if you’ve read the Terms and Conditions. Wait to see if you win! LotteryShop makes it easy for winners to claim their prizes. If you win, the company will send you a notification that provides in-depth details of the lottery, draw, division number, and how much you won. Meanwhile, if you were lucky enough to win more than $1,000, LotteryShop will call you by phone. Prize claiming, as I’ve said, is pretty easy – you don’t even need to travel far to collect your money. OSA, which, again, LotteryShop is a division of, will collect your winnings and deposit it to your bank account. This is also free of charge; plus, no commissions will be taken from your winnings. Choose from tons of lottery games! theLotter is king when it comes to game selection – they currently have 53 games on tap, after all. These include the most popular lotteries, like US Powerball, Euromillions and Mega Millions, plus less popular ones as well. They also offer 20+ syndicates and the occasional millionaire raffle. You can use a wide array of payment methods. They accept over 29 different payment methods, from credit cards to e-wallets and more. Prices are a bit expensive – though still cheaper than LotteryShop’s. theLotter’s ticket prices aren’t known for being cheap, but at least they are the cheaper option compared to LotteryShop. They offer more than single and group play games. Beyond the 20 lottery games and 13 syndicates, WinTrillions also offers several millionaire raffles and raffle syndicates. Tons of payment methods are accepted here. No need to have a credit card as WinTrillions accepts 32 different payment methods. They also don’t allow single draw purchases. Like LotteryShop, they don’t offer single draw purchases, which means that it will cost you more with each entry. Their game selection is comparable to WinTrillions’. LottoKings also offers 19 lottery games, plus some raffles. They offer less syndicates though. Claiming jackpots is easy here, too. If you win the jackpot, you can choose whether to let LottoKings claim it on your behalf or not. If you choose the former, you can get your money from them via check or by visiting the nearest LottoKings office. They accept a few payment methods. LottoKings accepts 10 payment methods, which is a bit disappointing. They still offer more than LotteryShop though. Is LotteryShop worth a look? No – you could do a lot better elsewhere. Despite getting some things right, LotteryShop is just a run-of-the-mill lottery site that ultimately offers nothing new to the table. It’s hard to recommend them to others when limited payment methods, zero single draw purchases, an archaic website and ridiculously outdated lottery results await you. Give this a hard pass. Operating online since 1996, LotteryShop is a division of the OSA, which stands for Overseas Subscribers Agents. The OSA has been in the business of entering players from all over into international lotteries since 1988. As part of their commitment, they also collect and send players their winnings, at no extra cost.